All reservations are held 15 minutes past reservation time. Bar and lounge will be offered for parties that arrive 15 minutes past their reservation time on a first come first serve basis. Rack of lamb chops were good, so was the bread they bring to the table. Still a little too pricey, I have to say I've had better food for less than this price range elsewhere. AMAZING.... all four of us loved our meals. I had Scallops, Beef Wellington and the Sticky Toffee Pudding, they were all wonderful. I would defiantly return and highly recommend!!! I ordered medium rib eye steak, but it was over cooked and the surface was totally black( bitter). The waiter was always in hurry, and makes me feel hurry too. 35 wedding anniversary, great food, couldn’t of planned it any better! Best meal I have ever had but very pricey overall. Never had we experience such amazing service. The food was some of the best we had ever had, best lobster we had ever had, the best steak my busband and brother had ever eaten. Be prepared to pay a big bill as the tip was more than what we normally spend on a meal alone!! But we knew it would be high and the food and service was well worth spoiling ourselves while we were in Vegas!! 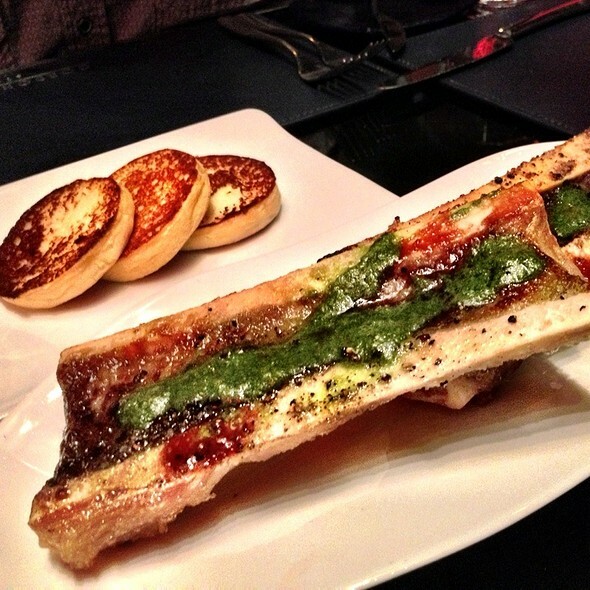 Too many other great restaurants to try in Vegas. The only reason I’d go back is if the meal was a casino comp. Front of house was truly incredible. Food phenomenal. Fantastic service makes up for the overpriced— and limited— menu. Once again we go here for our anniversary. We used open table to make reservations which was super easy. We checked in and had a great dinner. Service was great and food was delicious. 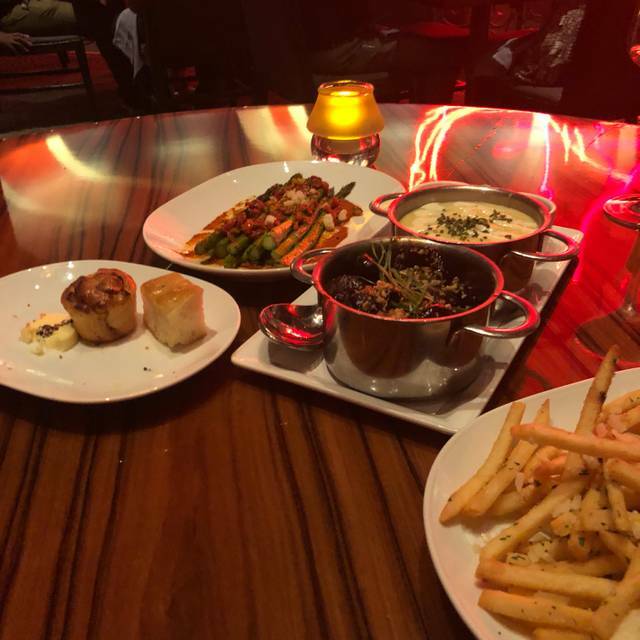 This was my 2nd dining experience from my last visit to Las Vegas. I immediately recommend Gordon Ramsay Steak on my FB page and on Yelp. I take stellar photographs to share each course and drink to make an impact on my experience. My waiter, nicknamed Goose, was what made my experience that much better. He was very engaging with me and other guests nearby. His recommendations were spot on. The assistants never missed a beat from serving my water, taking plates and even cleaning up all of the crumbs. Thank you again for making my favorite dining splurge the best. Service was outstanding. ..and the food was I can't even describe how fantastic it was. My hubby and I loved it. 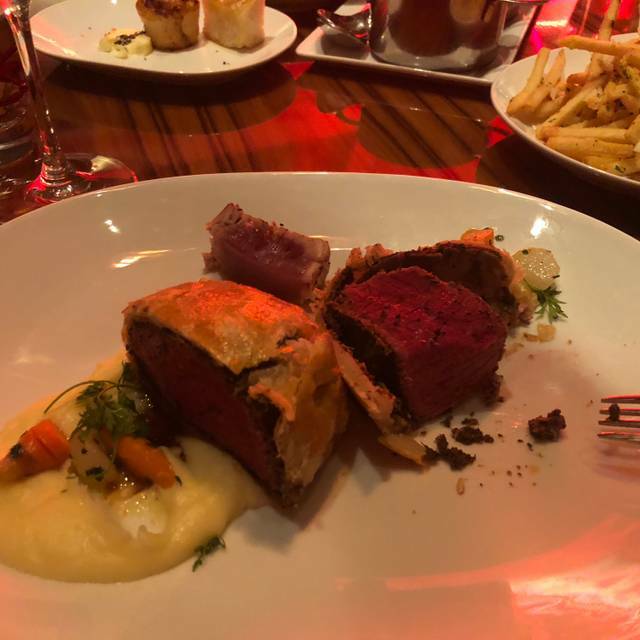 He had the beef Wellington and I had the waygu skirt, was amazing. The pork belly appetizer was delicious as well. It is pricey but it was a birthday dinner and we both love GR. What a fantastic experience. My wife and I were in town and decided to try this place for the first time. The filet was cooked to perfection. The salad was amazing. Not a single complaint on the food. The atmosphere was very nice. The tables are somewhat to close together. And it was quite loud but not unbearable. I would highly recommend this place to friends and will be dining again on my next visit. The pastry on the Wellington the tasting menu was soggy and the meet had a layer of fat around it. If we return we would get the Waygu steak which had a much better flavor and texture. As always the food was great. Our waiters were very accomodating and efficient. 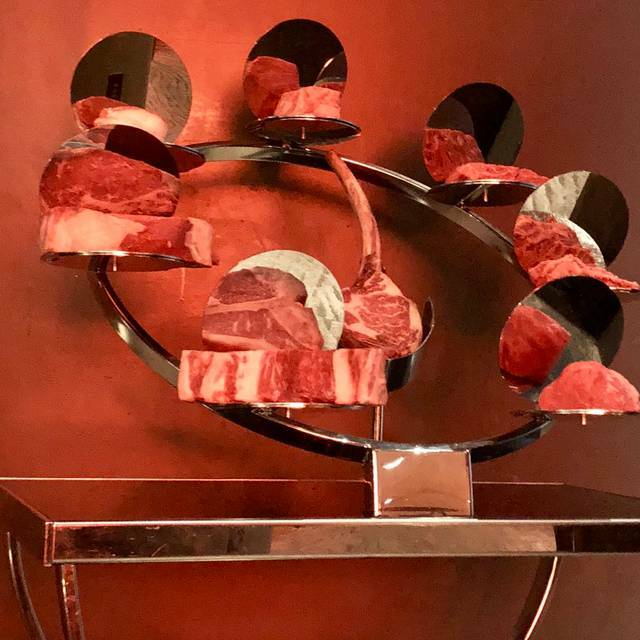 Always a difficult time trying to choose which steak. This time we both had the rib cap steak. 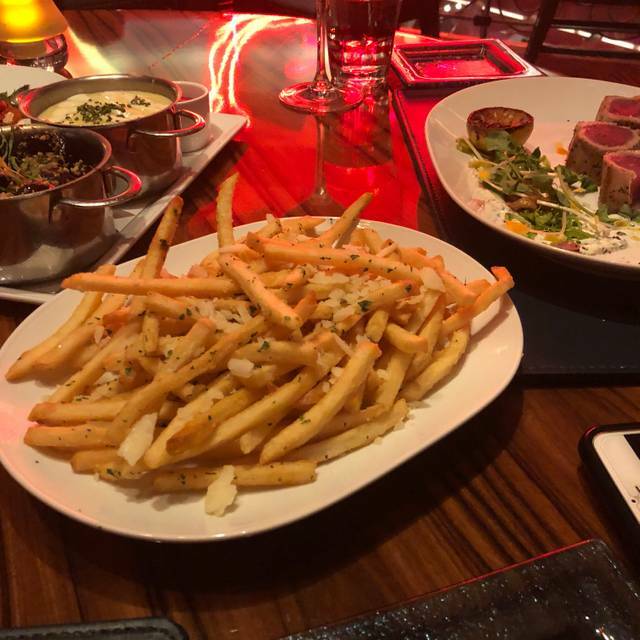 The evening was wonderful- my husband and I had an amazing dinner and best of all... got to see Gordon Ramsay and the cheftestants of Hell’s Kitchen show. It was truly an honor to see him!!! The food was everything and more. We did the special course they had. Wine pairing was perfect! The food was excellent. I would suggest the specialty seafood side dish be added to the regular menu. One of the most unique aspects was the coffee with chocolate covered spoons containing the amoretto and baileys. We eat out a lot and a special item like that can be what we really remember. Our waiter was very good and personable which made our meal even more enjoyable. Food was great. A bonus was that Gordon showed up as they were filming a segment for Hells Kitchen upstairs. What are the odds???? 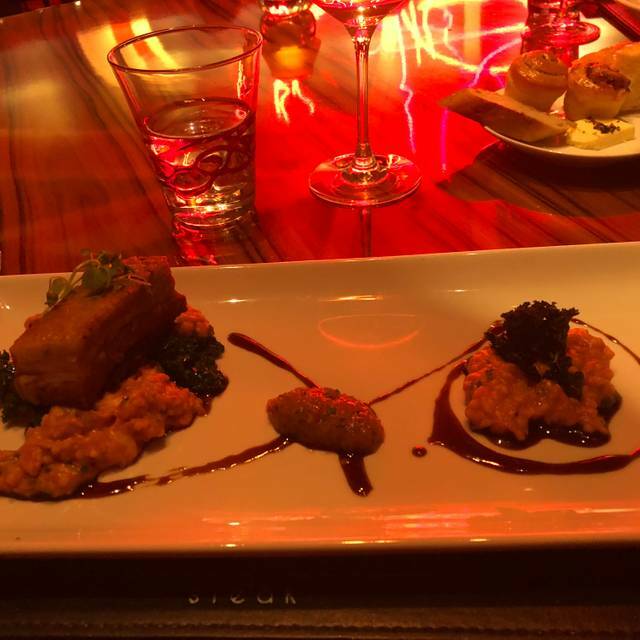 Had a really good experience at Gordon Ramsay Steak. We ordered the tasting menu and all the courses were delicious. Service was great as well. All the dishes were explained and the staff was attentive to our needs. Would definitely return and highly recommend the dining experience. Amazing food everything I was expecting and more. The employees were very friendly and knowledgeable. Every bite of everything was incredible. The staff are friendly and very attentive without being overwhelming. The food is amazing! Only complaint is that it’s a little too loud so it can make having a conversation a bit difficult. That’s just a small complaint though. Love the place! Been there twice and will be going again! Best dinner ever!!!! My husband and I were in Vegas and made reservations for this restaurant. We ordered the tomato lobster bisque, pork belly starter and the beef wellington and steak for dinner. Every bite was delicious. Can't wait to go back. Everything was very good. Great service and food but we wish we had known we could have split everything because portions are large. That way we could have made room for dessert. Next time! First class all the way and a great experience. We also ate ate hell’s kitchen and found that this was a huge step in decadence above that. This is now my favorite restaurant in Las Vegas and we ate at many ultra fine dining spots there . Decided to try something upscale for our anniversary celebration. I would have liked a little more private table like a booth perhaps, we were sat right across from where the staff brought food from the kitchen so there was lots of foot traffic past our table and we could hear some kitchen noise. Food was good, fingerling potatoes were a little salty for my liking but my husbands baked potato was delicious. The steaks were really tasty and done to our liking, my husband didn’t really care for the glaze on the mushrooms. Overall good meal and the cost was what we expected for a higher end restaurant. The food and staff were amazing!! The Scallop Risotto is to die for! The scallops literally melt on your mouth!!! 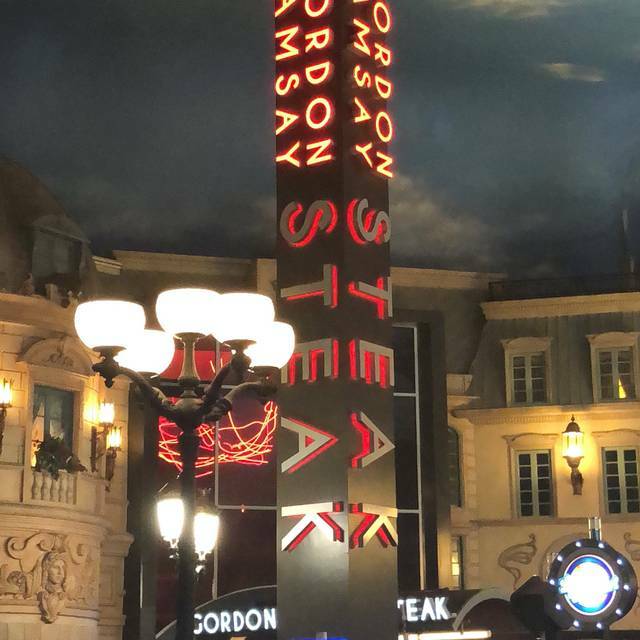 After having binge-watched the entirety of Master Chef over the past year my wife and I have been frequenting more Gordon Ramsay establishments when visiting Las Vegas. 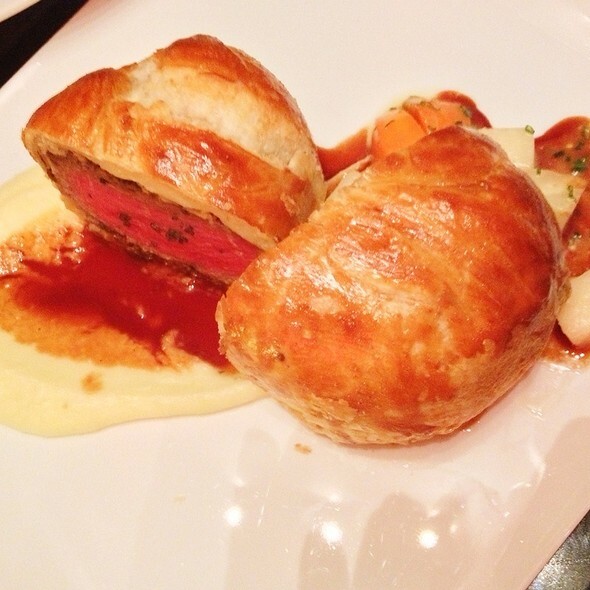 This was our first visit to GR Steak at the Paris Hotel and we 'had' to order the Beef Wellington. It is quite possibly the single best thing I've ever eaten in my life. We also had the mushroom risotto with scallops, as an appetizer, which was excellent. We were disappointed with the Rack of Lamb; a bit too fatty for our liking. 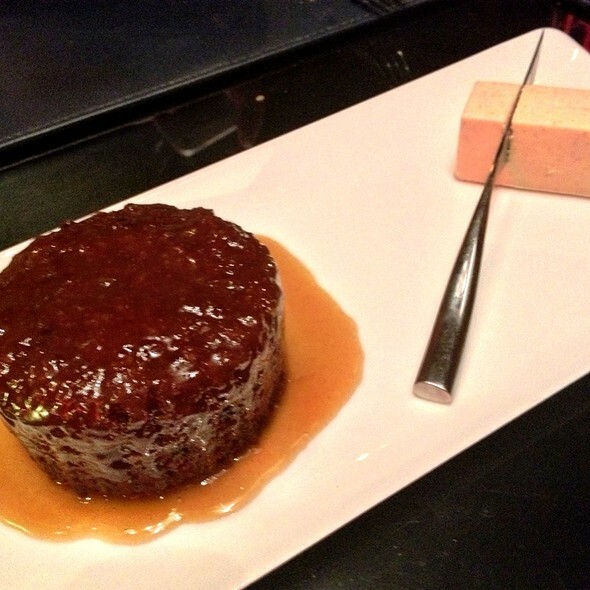 Of course we also had to try the "sticky toffee pudding" for dessert - delicious!!! Altogether, an amazing location. Great ambiance! Attentive staff! The cocktails were also good and reasonably priced (though their food options are, expectedly, more on the pricier side).